Personalize your own spirits, liquor or wine bottle and turn an ordinary bottle into an engraved memorable keepsake you will treasure forever. Your favorite spirits bottles such as Johnnie Walker, Jim Beam, Hennessy, Glenfiddich, Highland Park, Don Julio, tequila, scotch, whiskey, rum, vodka, or any fine wine bottles could be engraved with your custom message as a unique gift for all occasions or corporate gifts. 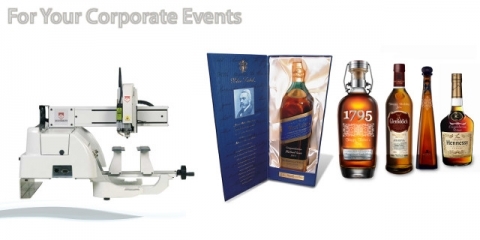 Mobile bottle engraving systems can be set up in any spirits retail location for special events, father's day, mother's day, Christmas, New Years or any corporate promotional marketing trade show. Turn an ordinary bottle into a special memorable gift for birthdays, anniversaries, graduations, weddings, corporate parties and holidays. Engraved liquor bottles designed with your personalized message is a way to create lasting memories. Our bottle engraving machines offers a unique and memorable keepsake. We have 25 yeas of experience with these mobile bottle engraving systems. We can also provide on-site bottle engraving stations on-site at your event. Our staff is well trained on these machines used precisely for this type of engraving service. We have rotary engraving machines and laser engravers capable of engraving both flat and cylindrical bottles. Our engraving equipment and software is configured with the bottle engraving templates with an on board touch screen featuring the bottle templates. This technology can engrave hundreds of bottles per day with perfect precision. Book us for your next event or just bring in your favorite bottle or glassware to be engraved in one of our retail stores. You will be amazed at the speed and the precision of our glass engraving systems.